Happy New Year everyone! This is the second of seven blog posts based on the Chinese tradition of ‘Open Door Seven Items’, or what might be called ‘the Householder’s Essentials’. My first post was about fire, wood and warmth. We move on now to the next level of human needs, i.e. 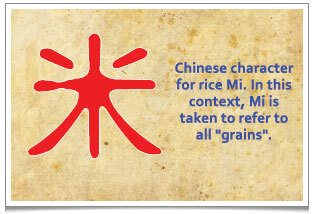 ‘Mi‘ 米 – ‘grains’ (a term that includes seeds, nuts and pulses). 1. 柴 “cai” fireword: Firewood provides warmth and heat for cooking food. 2: 米 “mi” rice: Five grains provide the base sustenance. 3: 油 “you” oil: Our bodies need some quantity of natural (animal and non-animal) fats. From eastern China came wheat – ‘dong xiao mai‘ 东小麦 – Yang, and green, and associated with the wood element the nourishment of the liver. From the West we have rice – ‘shui dao ‘ 水稻 – white in colour and representing the element of metal. Rice is linked to the functioning of our lungs. In the South, there grows millet or sorghum – ‘shu‘ 黍 – red in colour and representing the fire element. Millet is used in making liquor and is considered to represent the heart. Legumes/pulses – ‘shu‘ 菽 – mainly dark or black, hail from the North. The link here is to the water element and to the kidneys. From the central region comes yellow millet – ‘su‘ 粟 – symbolising the earth element and associated with the stomach. Several of these can be used to make traditional, midwinter eight treasures ‘la ba’ 腊八 congee recipes as I described here. Chinese doctors believe that our dietary needs depend in large part on our individual bodily constitution, which is partly inherited, hence the body type of our ancestors is also relevant. This has all sorts of ramifications. A southerner moving to western parts of China might find the white rice to be slightly too acidic or Yin for their taste; adding a little Yang cumin or cinnamon when steaming the rice makes it easier for the stomach to digest. Whilst wheat has slightly Yang attributes, it also has ‘explosive’ traits that make it unsuitable for someone with an inflamed liver; a better grain would be buckwheat, which is slightly Yin. So it’s a mixture of your own body type and your antecedents or origins that we look at. 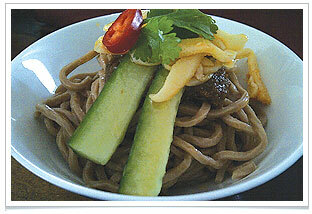 Oolong tea noodles with homemade hunan-style sauce at chaya teahouse. Traditional Chinese Medicine (TCM) differentiates between ‘dead’ and ‘live’ doughs. The former are made by the simple addition of water to wheat flour. They are relatively hard to digest. To overcome this problem, humans make use of micro-organisms (like yeast) to ferment dough a little before baking it. The other method is to add some form of fermented paste or sauce. Hence, when we make Oolong tea noodles at Chaya Teahouse, we serve them with our own Hunan-style sauce which is a mix of various fermented ingredients that help digestion. Modern day diets unfortunately tend to deviate from the wisdom of TCM. Grains are now treated as a side dish (if not completely eliminated) and meat has become the main focus. Even Chinese restaurants now encourage people to have cold appetisers, followed by a main (meat) course and then a dessert – a fine formula for a banquet but far from ideal for daily nutrition. I am not entirely dismissing low-carb diets, however. In ancient times, people laboured hard from sunrise to sunset, eating mainly rice with only a few vegetables or tofu: obesity wasn’t a problem back then! Then again, not all sugars are the same! The ultimate motivation of any organism is to sacrifice itself for the next generation by storing the most essential nutrients in its seeds. If you look at many plants, despite having diseased leaves or roots, their seeds will still be perfect. 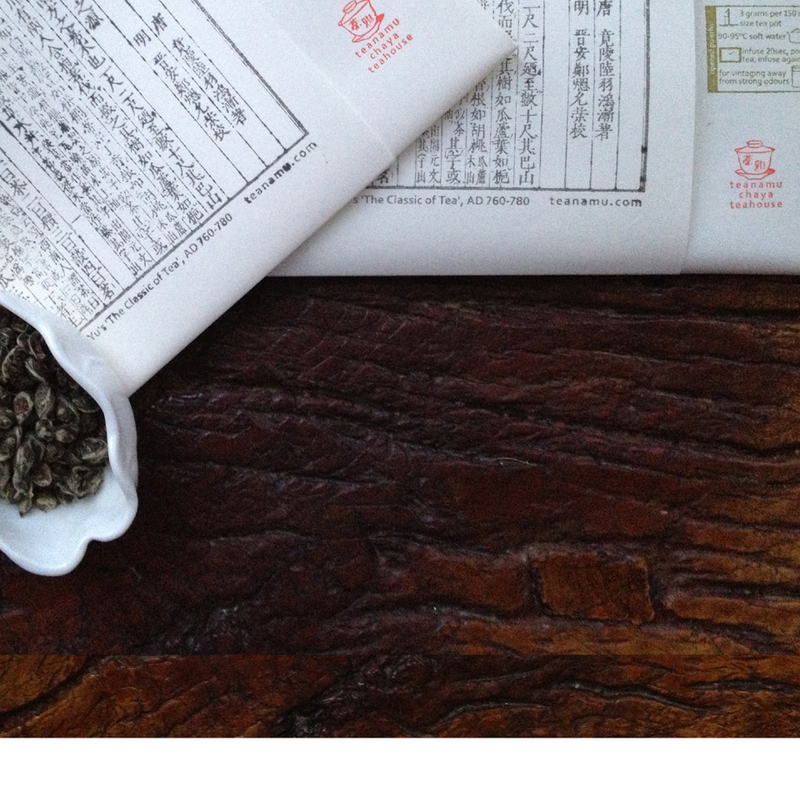 TCM conjectures that sugar found in seeds and other grains is particularly rich in Qi 氣 energy. TCM views diabetes as resulting from the inability of the inner core energy to digest or get rid of foreign substances without additional insulin. It believes the underlying cause is inadequate consumption of grains (including seeds, nuts and pulses) and excessive consumption of what should properly be side dishes i.e. all the non-grains. This includes foods like meat and fish, the things the rich can afford – indeed, diabetes is sometimes called ‘fu gui bing‘ 富贵病 – ‘illness of the rich’! The Cantonese language, interestingly, has a character ‘song‘ 餸 to refer to all the non-grains, and it is composed of two characters meaning ‘deliver’ 送 and ‘food’ 食. Non-grains are just there to ‘deliver’ or facilitate the ‘proper food’, which is the grains! The two Chinese characters that together mean hunger/starvation are ‘ji er‘ 饥饿 but most people do not understand the difference between these two. Ji 饥 refers to the need to fill up the stomach and intestines when empty. Er 饿 is the sense of craving that results from ingesting the wrong type of food, an insufficiency of the proper nutrients the body demands. Thanks to Er, some people are always hungry even though they have eaten a lot of food. A simple bowl of steamed rice is very aromatic. Accompanied by a little side dish of vegetables, fermented bean curd or natto, it’s enough to make me feel full and satisfied. I always feel much better (neither ji 饥 nor er 饿) when eating this way. TCM encourages people to understand and listen to their body and understand the difference between needs and wants, to eat seasonally and not to excess. Stay tuned for more ancient wisdom about Seven Essential Needs in Part 3 of ‘Open Door Seven Items’! I love reading these informative posts, Pei!